What’s the first thing you do when you’re starting a new business? The first thing should be doing some thing. Some thing like figuring out what you’re selling. Or fine-tuning a business plan. Determining how much capital you’ll need to get up and running is also an important place to start. For under $200 you can set up a template website and get a crowd-source produced logo. For a few more dollars and some time you can create the content and copy for your website and a brochure that you can plug into a templated design. These types of businesses are all over the web and contrary to what my colleagues probably say, they’re good for you — at the right stage of your start-up. The difference between these companies and the hiring of a professional brand consulting firm like SOZO | Pivotal is the depth at which these services are performed. When you are starting and getting your business off the ground you don’t have time to collaborate with a company that is going to take you through the necessary steps to effectively position you today and for your future. It’s quite frankly just not a good time to throw resources at that. Work on your product or service first. Only you can do that. Make sure you set your company up to be positioned as the best in a specific area. You don’t differentiate by saying or looking like your different. You differentiate by actually being different. When you’ve reached that stage, it’s time to really get serious about the visual identity and messaging that leads your marketing and sales efforts and using templates and designs that are generally amateurish and accessible to anyone with a Benajmin in their pocket just won’t cut it in taking your company to the next level. Dont hire an agency to help you define your position; hire them to help you communicate it through all the necessary channels. This is hard for many business owners to understand — especially after their businesses start to fail and they blame their PR firm or ad agency for their lack off success. The best entrepreneurs realize that a lot of people help them along their road to success, but when they fail, they immediately accept all the responsibility. Too often society likes to label entrepreneurs as greedy, but I think it’s quite the opposite. The smart business owner knows that rewarding others for his company’s success usually generates more success while passing the blame for failures does nothing to turn the corner from continued failure. There’s also a big difference between starting a company as a new versus seasoned entrepreneur. Experienced business leaders tend to know precisely when to hit the proper growth accelerators like professionally branding and taking their image and packaging to another level. Regardless of whether you have the money or not, it should never be wasted or spent unwisely. How often have you heard, “if only I had the funding to do this?” On the contrary we’ve worked with businesses that probably had too much money and not enough focus. It’s a fairly common imbalance. Looking back, those engagements were oftentimes scrapped because of poor vision. That’s irresponsible spending no matter how much is in the coffers. The message here is that you can’t do everything for your business immediately. There’s no such thing as overnight success and bringing in professionals to help you grow too early is really a recipe for disaster. And that disaster is too often blamed on those who participated rather than the one who made the call to hire the agency too quickly. At SOZO | Pivotal we look to work with the right companies. You’ll hear us talk about passion a lot, but the second most important criteria in client-agency collaboration is timing and we haven’t been scared to tell someone that now may not be the right time. Sure we’ve turned away some business with that approach, but one thing we have prevented is the creation of a relationship that is doomed from the start. And we feel pretty darn good about that. If political advertising teaches us anything, it’s that advertising is an effective form of brand building. For many, politicians are considered the bottom feeders of society. Why? The negative ads make them look that way and the positive ads carry on about promises that never come to fruition. I think it’s fairly safe to say that that’s not just my opinion and it’s not a partisan perspective either. I’ve had enough water cooler conversations with all kinds of folks to know that this is a common feeling on both sides of the aisle. You don’t need me or this blog post to tell you that there is something so incredibly wrong, disgusting and irritating with the political advertising platform — especially the portion of it that we see on TV in the form of the 30 second advertising spot or in our mailboxes in the form of junk. It doesn’t take long to tire of the dark and gloomy ads. It happens during every campaign season and it gets progressively worse and more hard-hitting as we get closer to the first Tuesday in November. There’s a lesson in these horribly-produced and generally indistinguishable negative campaigns: if you ran your business the way every politician runs their campaign you’d be out of business by next Tuesday. Whenever a discussion with a client goes in the direction of focusing more on a competitor’s weakness than their own strengths, we encourage them to focus on what the positioning should be all about — them! If you can’t create a solid and positive position for your business, you don’t have a business. Only in politics can you get away with being mean-spirited and obnoxious. The sad fact is that if a politician doesn’t use sticks and stones and name-calling, he simply won’t win. This is the best example that most politicians don’t operate in a “real world” environment. And if they don’t run in real-world circles how can they govern within it? But that’s a post for another time and another blog. This is about marketing and branding and how businesses must differentiate by focusing on themselves in a crowded marketplace. How can trashing your competition be a feasible marketing plan? How can distorting the truth in order to place you in the best possible light while making your competitor look like a fraud be considered a good business move? For those of us who aren’t politicians, it can’t. And quite honestly, it’s sad that we as a society put up with it. We would never take it from the mom and pop store down the street. Not today. Certainly not anymore. Look at how we expect only the highest level of customer service when we walk into a store or visit a website or call the utility company. Why do we demand more from businesses that have owners and shareholders who’s careers are on the line than from career politicians who lie and finagle their way around their own shortcomings? The difference is on Main Street we have choices; more choices than ever, and certainly more than just two. I don’t watch a whole lot of TV so the political spots actually don’t even really affect me. But I’m a firm believer that political advertising should be banned completely — for the good of the political process that should rely on knowledge and truth rather than dollars and (cents)ationalism. Hold debates and town hall meetings, but stay off the television timeslots that are paid for and stay out of the mailboxes. Leave the airwaves to those who have something good to say. And yes, I believe that that can actually be a politician with a positive message and position. Lot of fuss around the internet about iTunes’ new logo. In fact I see Wired is doing a contest to redesign the “ugly” icon. I’m not all that bothered by the new logo. 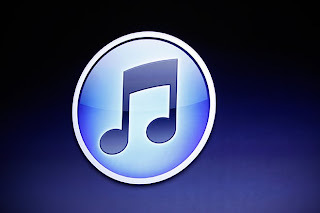 It’s the name “iTunes” that doesn’t make sense anymore. iTunes was great when it was just a music store. Today it’s obviously so much more. In addition to music and TV shows, it sells the apps and syncs your computer with your iPods, iPhones and iPads. It should probably be called something like iBuy. Or how about iCan’tDoAnythingWithTheseAppleGadgetsWithoutIt? I enjoy following the Brand New blog. Pretty much every day they feature a company that has gone through an identity change. They also provide an interesting insight into the before and after of the corporate identity and the comments section never disappoints in providing a lively discussion between I hate it and it’s the best brand re-design I’ve ever seen. This morning’s post definitely caught my attention and brought me back about 10 years ago. Back in 2000 we were hired by a new restaurant to create a logo and identity campaign that would be carried out through all location signage and marketing materials. This particular client knew exactly what he wanted but had a difficult time communicating what that was. We visited art galleries and he showed me pictures of vintage Italian advertising artwork. He finally said he wanted a woman sitting on a crescent moon. I could now share his vision. The end result is what you see above. He loved it. It worked great for the restaurant — which has since closed for reasons I’m sure had nothing to do with this logo. Any time we create an icon for a company it’s usually an interesting process. This, however, is one of the favorite stories. After getting clear on the fact that the client wanted a sultry woman hold a glass of wine while sitting on a crescent moon, I started sketching and brainstorming. I knew I needed to bring in an illustrator who could get the job done. After working out the concept and collaborating with a few people I decided to work with an illustrator who, um, specializes in adult comic book design. Needless to say the first round of sketches were eye-catching. After toning this guy down a bit we made the dress a little less form fitting, showed a little less leg and gave her some under garments…if you know what I mean. It was a fun project, I just wish I could dig up some of those early concept sketches — unfortunately when you have to throttle back a designer for any reason you tend to not get his best work. While happy with the final product, I always thought the final design looked a bit compromised. Fast forward a year and a half after the launch of the restaurant. My client calls me and says he’s received a letter from the Miller Brewing Co. requesting that he stops using his logo which they claimed was a copyright infringement of their “Girl in the Moon” icon that supposedly was on the old Miller High Life bottle labels. Without having a Miller High Life in hand or in the fridge, I had no idea what he was talking about. I could picture the bottle and packaging, but I didn’t recall there ever being a woman sitting on a crescent moon. Curious, I jumped in the car and visited the grocery store. Walking down the beer aisle I found what I was looking for — verification that there wasn’t any woman on the Miller bottle. Now I was even more confused. I got a copy of his cease and desist letter and read through it. I made sure he understood clearly that we didn’t “borrow” any creativity from Miller. He understood and said he was just as surprised. A few days later my client called and said he contacted an attorney who told him not to get too worked up about it. Miller couldn’t actually own all women sitting on crescent moons — especially since the Laluna woman was in a very different pose and wearing a flowing gown rather than the red outfit worn by the Miller version. It was one of those cases where it seems like Miller just wanted to throw a little weight around. They weren’t interested further exploring or really concerned about the Laluna Grille’s use of a similar — whether intentional or unintentional — creative direction. A few months later I noticed Miller High Life starting to use the Woman in the Moon graphic in their bottle packaging. They must have been trying to protect its design prior to incorporating it into their marketing. Now, as Brand New reports and shows in the images, the Woman in the Moon gets some retouching and a more prominent role in the product packaging. And the Laluna Grille? Attempts to visit their website bring up a dead link and calls to their phone number tell us it’s disconnected. While I’ve chatted with the owner off and on over the past several years it’s probably been a few years since we connected. At the time he had move out of state and left the restaurant to his co-owners. I loved that project and the story behind it. Thanks to the re-branding by Miller High Life, it inspired me to share it once again.